Delmarva Now had an excellent feature article about former Terp Andre Collins (2001-04), who was named Italian Lega2 MVP this spring, while his club, Carife Ferrara, won the Italian Lega2 Championship and earned a berth in the Italian Series A league next winter. While the 25-year-old Collins was the named league MVP this season, that kind of success was far from his mind at the beginning of his rookie campaign, when he was struggling to adjust. But that uncertain period didn't last long. "I had a pretty good rookie season," he said. "It was very difficult to adjust, because European basketball is totally different. It was like my first year at Maryland, when it took me a while, but by the time ACC play rolled around after playing against Steve Blake and Juan Dixon all the time in practice, I was able to compete." 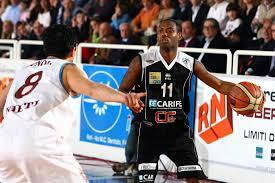 Collins is signed to play for Carife Ferrara again next season. James Gist (2004-08) was drafted 27th in the second round of the NBA Draft (57th overall) by the San Antonio Spurs. Gist is the seventh Maryland player taken in the draft in the past eight years and the 16th Terp picked under coach Gary Williams. All things considered, there are far, far worse fates than to get to go to training camp with the Spurs. Plus, there's that whole reputation for not making too many scouting mistakes. Gist watched the draft from his parents' home in York, Pa. He was outside getting some fresh air when he heard the celebration. He'll try to join an experienced Spurs roster that is perennially a threat to win the NBA championship. Second round picks are not guaranteed contracts in the NBA. Many second rounders initially play in Europe or the NBDL, a developmental league designed to prepare players better for the NBA. "We're thrilled with James Gist from Maryland. He's a heck of a rebounder, he's a good scorer ... does a fine job," Popovich said. The San Antonio Express says that he is a "stubborn defender who will buy into Spurs’ defense-first philosophy." Local Terp blogs Turtle Soup and It Never Rains in College Park have some good commentary, as they join me in being happy for Gist and Maryland Basketball this morning. The European free agent signing frenzy contines, as Drew Nicholas (1999-2003) signed a new, two year deal with Panathinaikos, of Athens, Greece. Nicholas had been on the sidelines all spring after his Turkish team, Efes Pilsen, released him for refusing to travel to Serbia for a Euroleague game. Panathinaikos is also the current team of Sarunas Jasikevicius. There is no such certainty for Gist. Instead, he attended the league's predraft camp in Orlando, Fla., last month. He has spent the last two weeks on the road, bouncing from workout to workout. Among the stops: Houston; San Antonio; Sacramento, Calif.; Chicago; Portland, Ore.; Cleveland; Toronto; and Milwaukee. Less than a week ago, Boston called to arrange a workout less than 36 hours before the draft. All could be destinations for Gist, who is listed among the final 10 picks on several mock drafts. NBAdraft.net projects him as the 51st pick to Dallas, while Draft Express (54th to Houston) and Collegehoops.net (58th to the Los Angeles Lakers) also have him being selected. Gist welcomes any role he can claim and realizes that he won't be a double-double threat like he was over the past couple of years. "Coming into the NBA, I don't plan on playing a lot," Gist said. "They have their guys who can do a lot of scoring, and I don't look at my role as that. I'm a defender; I look to defend the [small forward position]. Come in and guard the Tracy McGradys of the league, the Kobe Bryants." Update! James Gist was drafted by the San Antonio Spurs with the #57 pick. "A player of Morris's caliber, just could not avoid the area of CSKA interest," CSKA CEO Andrei Vatutin said of the signings. "Last season demonstrated how valuable he is as a player, and we could see it during Final Four in Madrid… It is not so easy to earn All-Euroleague Team selection. I am very happy that CSKA managed to win the battle for this player against the biggest European clubs. It is very important that Terence gladly responded to CSKA’s proposal and is ready to meet our requirements." CSKA trumpeted their signing in a press release, while local Israeli papers like the Jerusalem Post and Ha'aretz lamented losing one of their stars.